Thanks for your kindness sir. Glad to meet you. The September 11 attacks were a violent act against humanity. People from All races, religions and social status were murdered that day including more than 300 people of Muslim faith died that day, some of them while trying to rescue others. Just YESTERDAY, a series of bombs and gunfire attacks across my country, Iraq, left 52 Iraqis dead and more than 200 others injured. It was executed by the same terrorists who were behind the tragic event of 9/11 and for the same reasons. 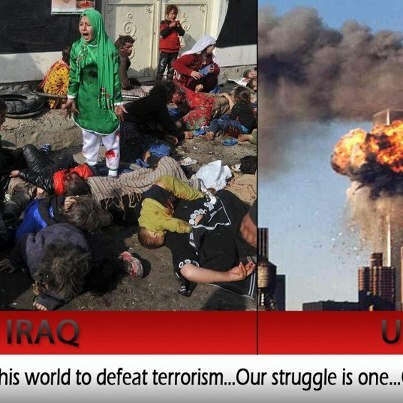 The sad thing is that most people don’t realize that Iraq has endured 9/11 more than “400” times and there are STILL people around the world think that those terrorists share the same believes with Muslims!!!! Please brothers and sisters in humanity, know that “the face of terror is not the true faith of Islam”. Those terrorists hijacked my religion and we need unity in this world to defeat terrorism…Our struggle is one…Our enemy is one. In memory of this tragic day, let us join hands and pray for those souls who passed away on 9/11 and let us not to forget to pray for the 1.2 Millions of Iraqis that have been killed in terrorists attacks since 2003. Please share this message with your friends to let the voice of love & unity be heard.